What are the Different Types of Grasses? What Are the Tallest Ornamental Grasses? Ornamental grasses are becoming quite popular with garden designers. They add texture and interest to the garden, and when combined with a gentle breeze, the garden comes to life with sound and motion. The smaller, clump forming grasses are valued as accent plants, while the larger ornamental grasses such as Pampases are useful for their architectural stature, and combine well with evergreen shrubs to create a privacy screen. The graceful, arching foliage of grasses display rich colors over a long season. Greens and blues are common in the summer, followed by rich, autumnal colors in fall and winter. Most have seedpods, flowerheads or plumes that dry well and last into winter. Leave the seedpods and plumes on the plants to add interest to the garden over winter, or cut them for long-lasting indoor arrangements. 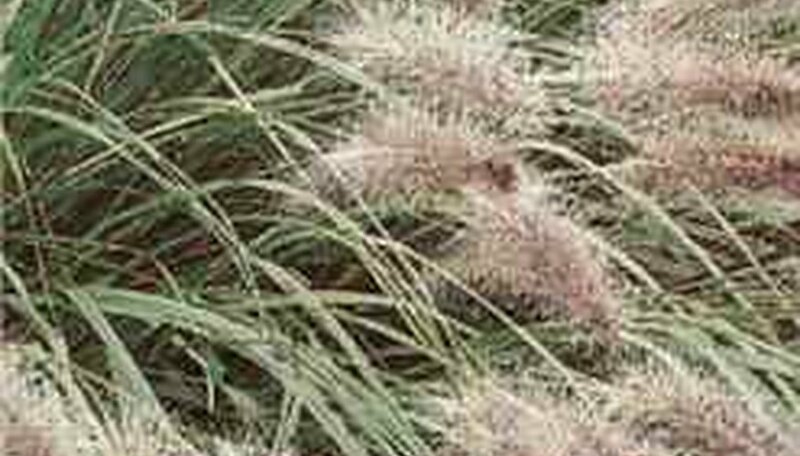 Ornamental grasses need full sun and well-drained soil. They are a good choice for busy gardeners because they require little or no pruning, they are resistant to most insects, and they tolerate drought well. Deciduous grasses are cut back in mid- to late winter to make room for new growth. Ornamental grasses provide structure and height to flowerbeds and landscaping. They are also surprisingly drought tolerant and work equally well in cottage gardens and formal gardens. Ornamental grasses die each fall with the onset of cold temperatures. If you allow them to remain unpruned you will have the joy of watching sunlight catch the frost that will trace the stems and seed heads. There are two types of ornamental grasses: those that form bunches and those that spread by rhizomes. Both should be cut down or pruned in spring to allow the emergence of new growth. Cut back ornamental grasses in early spring before new growth appears. Use loppers or hedge trimmers for ornamental grasses that form clumps (pampas grass). Cut back to 4 to 10 inches high. Use a lawn mower or weed trimmer to cut back ornamental grasses that spread by rhizomes (ribbon grass). Cut these grasses to 3 to 5 inches high. Ornamental grasses include short, ground covers, as well as tall, stately specimens. The term also includes bamboos, rushes and sedges. Colors of ornamental grasses range from bright green to golden yellow, and from muted green to silvery-blue. Variegated grasses can be striped horizontally or vertically, speckled or blotched. Some ornamental grasses form rounded to upright clumps, while others spread over large areas. Cool season grasses bloom in fall and turn brown during the winter. Warm season grasses are usually evergreen to semi-green with blooms in the summer. Ornamental grasses add height to planting areas without the heaviness of shrubs and serve as accents to the brighter colors of flowers. They can also be massed together for a natural effect. Japanese Sweet Flag (Acorus gramineus) and Cord Grass (Spartina pectinata) grow in wet or boggy areas and can be used in or around water features. Most ornamental grasses prefer full sun but sedges (Carex sp.) and Northern Sea Oats (Chasmanthium latifolium) will grow in the shade. Perennial ornamental grasses can be planted in the spring or fall, but they should be divided in the spring to allow time for the flowers to develop. They should be divided when the center begins to die out. Annual ornamental grass seed should be planted in the spring after the last frost. Warm season grass seed is best for areas in northern Alabama. Mixtures that work well there include Bermuda grasses, centipede grasses and carpet grasses. According to Outsidepride.com, "turf-type" fescue can work well in the most northern areas of the state. Select stalks of ornamental grass for drying. Pick a mixture of tall, medium and short stalks, to give your arrangement some depth. Cut the stalks off at the base with your garden clippers. Immediately stick the chosen stalks into a vase filled with water. Wash stalks in water and mild detergent, to get rid of any small insects that might call your stalk home. Tie a cluster of stalks together with string and hang upside down in a warm, dry place to let them dry. Keep them in the warm, dry place for one to three weeks to dry completely. Spray any brand of hairspray lightly over your dried ornamental grasses to minimize the chance of breakage. Consider a coat of hairspray an invisible shield of armor that will protect your ornamental grasses, which are typically fragile. Let dry overnight. Then you're ready to start arranging in vases or urns. Bluestem grasses (Andropogon species) are large bunch-type grasses native to the Great Plains. They are tolerant of infertile soil and drought, but cannot withstand flooded soil. Bluestem grasses are good for erosion control, and the seeds attract wild birds. Blue grama grasses (Bouteloua species) are also native to the Great Plains. They are bunch-type grasses that tolerate poor soil, and provide wildlife food and soil stabilization. Buffalo grass (Buchloe dactyloides) is a blue-gray grass native to the middle southern United States. It is drought resistant but does not tolerate sandy soils. Indian grass (Sorghastrum nutans) is a bunch-type grass native to the prairies in the central and eastern United States. It tolerates poor soil and moist conditions. It is used for erosion control and wildlife habitat. Kentucky bluegrass is a cool season grass that loves partial shade and moisture. Its short root system causes it to go dormant or die in hot weather or drought conditions. Mixing Kentucky bluegrass seed with a hearty seed like rye can aid in its growth in warmer climates. Zoysiagrass is a hearty grass that has a long root structure to aid in drought tolerance. It stands up well against sunlight and heat, but in extreme temperatures will turn brown and wither. It depends on regularly weekly watering. Tall fescue grass is shaggy and vibrant, dark green in appearance. It is tolerant of moderate sunlight and heat but must be watered regularly to maintain a healthy appearance. It grows in bunches, so care must be taken to keep it free of weeds. Perennial ryegrass germinates quickly, but contrary to its name, it ordinarily only grows for one season. It is a vibrant and lush variety of ryegrass, and if the seed is mixed with a blend of heartier grasses, it can produce a desirable and moist lawn. Ornamental grasses should be cut back in the fall once they have gone dormant. Cut back an ornamental grass to a height of 6 to 8 inches. Alternatively, if you want to retain a winter grass effect, cut it back in the very early spring before new growth appears. Assess the size of your ornamental grass. Smaller ornamental grasses can be dug out of the lawn, but larger ones, such as mature pampas grass, have a massive root system that is not easily dug out. Pull on protective clothing, including gloves, long sleeves and long pants, safety goggles and close-toed shoes before killing ornamental grasses. Bind the grass into a sheaf using rope or bungee cords. Cut the grass to the ground using a chain saw. Dig smaller grass roots from the ground using a spading fork. Treat the cut stems of larger clumps of ornamental grass with a systemic herbicide containing glysophate. Cut back the grass clumps and reapply the spray whenever the grass shows signs of growing again. Some ornamental plants are cultivated for their attractive and brightly colored foliage, whether the leaves are evergreen (which means that they always remain green) or deciduous (which means that the leaves turn yellow, red and orange before dropping during autumn. Some varieties of leaves are considered to be particularly attractive, due to factors such as slender and long needles or lacy textures. Leaves with unusual colors (including silvery-gray) are also common in ornamental plants. Many ornamental plants are grown for their showy blooms. Flowering ornamental plants are especially common, for both outdoor gardens and as houseplants. Many flowering plants are used also not only for their attractive appearances but for their pleasant fragrances. These include magnolias, gardenias, lilacs, roses, lilies, wisteria, honeysuckle, petunias, daffodils and plumeria. Certain varieties of ornamental plants are cultivated for their shapes. Vine-like plants are cultivated to be trained into growing onto specific things, such as fences and trellises. Evergreen shrubs and trees are trained, by constant pruning and trimming, to create topiaries and hedges. It is very easy to find and purchase ornamental plants. Ornamental plants can easily be found at nurseries and garden supply shops. In an individual is seeking a particularly rare ornamental plant, the majority of shops can help with special order requests. Countless types of ornamental plants are out there. Some of the most popular ornamental plants are azaleas, sunflowers, white forsythia, Japanese maples, American century plants, agaves, roses, African blue lilies and Peruvian lilies. Cut ornamental grass when the characteristic spray appears in full bloom. Allowing the bloom to go to seed results in heads that fall apart easily as they drop seed. Harvest grass on a clear dry day when foliage is dry. Cut to the desired length. Keep in mind that you can shorten stems when you are ready to use them so longer is actually better. Gather the grass into loose 2-inch diameter bundles of stems. Secure the bundles with twine or rubber bands. As the stems shrink in drying, rubber bands will hold the bundle securely. If you use twine, you may need to tighten the bundle after a few days. Hang the bundles upside down in a dry well-ventilated area. A garage, workshop or attic works well, as long as there is adequate air circulation. Check bundles every few days for any signs of mold or mildew and remove any affected stems. Turn the bundles for even drying if necessary. Allow to dry for 7 to 14 days, until the stems are brittle and snap easily. Stems that bend are not dry enough and should be left for an additional 5 to 7 days for thorough drying. Clean old leaves and garden debris from around the base of a dormant ornamental grass clump. Wait until early spring, because the dead top growth helps protect the base of the plant from freezing weather during the harshest part of the winter. Wrap and tie string around the leaves or fronds of the ornamental grass 6 to 10 inches from the bottom of the plant. This is to gather the leaves so they are easy to pick up after they are cut. Cut off all dead leaves in one even cut 3 to 4 inches above the ground. Clean out any leaves that are wrapped around the base of the plant. Add new mulch around the base of the plant without covering the crown. Covering the crown with a thick layer of mulch may cause the crown to rot. Shear off last year's growth so that the plant stands 4 to 5 inches tall. It is best to do this in early spring before the growing season takes off. Decide how many plants you will be splitting the grass into. Split the grass by angling the spade directly down into the clump. Decide on the size you want the new grass to be and then make another cut into the grass. Lift the new portion of the grass out and replant it in the new location. Place at least three inches of mulch around the new transplant and make sure to give it a heavy watering to allow it to begin to root. All Gold ornamental grass has a bright golden color with dense bamboo-type leaves growing between 8 to 15 inches in height. All Gold grass is widely adaptable to a variety of soil conditions and can grow in partial sunlight, making this particular ornamental grass a popular choice for adding color to a shady lawn or garden areas. Elijah Blue fescue ornamental grass has a bluish-gray color and grows in large, dense plumes with a height of 12 inches and a spread of 12 to 14 inches. This grass requires direct sunlight for optimum growth. Ornamental trees are ideal for city dwellers. The compact size of ornamental trees allows for greenery where a larger tree wouldn't ordinarily fit. Cities throughout the world frequently plant ornamental trees in small spaces between or in front of buildings in order to add a little nature into the urban landscape. With heights frequently under 25 feet, ornamental trees work well in gardens that are already pressed for space. Gardeners living in hurricane prone or windy areas will have less fear that their tree will fall over and seriously damage their homes. Many ornamental trees are cultivated for their blooms, which signal the beginning of spring and add a much needed burst of color into the air. Popular species of flowering trees include Japanese cherry tree (Prunus serrulata), flowering dogwood (Cornus florida), flowering crabapple (Malus) and various species of hawthorne (Crataegus) trees. 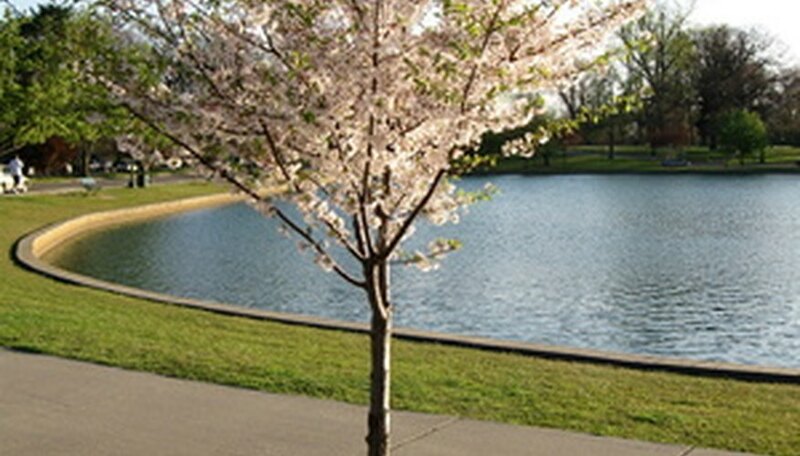 Flowering ornamental trees also attract wildlife such as birds, butterflies and bees. Unlike many species of exotic, tropical ornamental plants that must be shipped at the risk of the buyer, ornamental tree species are widely available at local nurseries. Gardeners from almost any climate should have little trouble finding a species of ornamental tree well suited to their environment. Many species are quick growers and will establish themselves in new soil with just a little effort and care. One ornamental grass that is around 2 feet tall is Indian ricegrass (Achnatherum hymenoides), which is a cool season perennial. Ornamental grasses is a term used to describe grass species that are mainly used for accents in the landscape as opposed to a lawn. The tallest ornamental grass is the bamboo Dendrocalmus giganteus, which grows to more than 100 feet. Arundo donax, a giant reed, is the tallest non-bamboo ornamental grass at an average of 20 feet.